As the bargain brand of Johnson Tech, Merit treadmills are designed for walkers and lightweight individuals who don’t want to spend a lot of money on a cardio machine. Headquartered in Madison, WI, Merit Fitness is owned by Johnson Health Tech, one of the largest fitness equipment manufacturers in the world. Johnson produces a number of home treadmill brands including Tempo, Horizon and AFG. They are also the parent company for the Matrix and Vision brands in the commercial line. Merit Fitness claims to test ten percent of its products at every phase of manufacturing to ensure that parts fit together as designed and that the quality is ensured. In our research and reviews of Merit treadmills, we found them to be very competitive in the under $600 price class. At around $349, the 715T Plus has a 1.25 chp motor, a manual incline adjustment, an 18" x 47" walking area, and four programs. It comes with a one-year warranty on the motor and 90 days on other parts. The 725T Plus offers a 18" x 45" walking surface, 1.5 chp motor, and a power incline on a 108-lb frame. It sounds like great deal but a weak drive motor and a weak power incline motor on a $450 machine is asking for trouble. The 735T has a 1.75 chp motor, a power incline, heart rate monitors on the handrails and a fold-up frame. At $549, it offers better value than the other two. Note that the 715T Plus and 725T are currently sold at Amazon and they both receive very favorable reviews from customers. Both receive a total of 4 stars out of 5 with hundreds of votes. One of the main weaknesses in these treadmills is the 90-day parts and labor warranty, whereas other budget brands now offer up to a year on parts. You should factor in the cost of any extended warranty if you plan to purchase one of these machines. Two more issues are poor customer service and weak motors. Kudos to Merit for putting honest horsepower ratings on their motors, and they should be advertised as walker’s machines. As for getting help, once you have trouble with one of these treadmills, you can expect to spend a lot of time on hold and will likely be told that the part you need is back-ordered. We hope they can get these problems solved and the business glitches eliminated because if they do, Merit treadmills will be a great viable alternative to ICON Fitness brands Weslo and Gold’s Gym which currently dominate the under $500 treadmill market. Click here to write your own review! Merit 715T Treadmill - The 715T is a stripped down machine that's designed primarily for casual users or those who will be using it for walking rather than running. 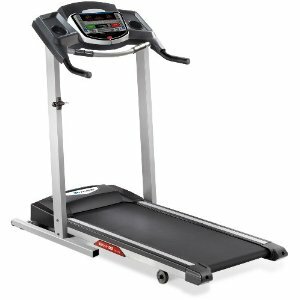 Merit 715T Plus Treadmill - One of the better power treadmills at the entry-level price of $350. Merit 725T Plus Treadmill - Suitable for most walkers but not recommended for runners. Don’t expect the motor to last even if you are a casual walker. Merit 725T Treadmill- The Merit 725T was the company's mid-range offering and is still available on a few sites, but is primarily found these days as a used model. Merit 735T Treadmill - For all of the features that are included on the Merit 735T, it doesn't look to be a tough competitor against other machines selling for less than $600.